This study explored the immediate effects of a course of Mindfulness-Based Cognitive Therapy (MBCT) for chronically depressed participants with a history of suicidality on the specificity of important goals for the future. Participants were randomly allocated to immediate treatment with MBCT or to a waitlist condition and life goals were assessed both before and after the treatment or waiting period. Results showed that participants receiving MBCT reported significantly more specific goals post-treatment whereas those allocated to the waitlist condition showed no significant change. Similarly, participants allocated to MBCT regarded themselves as significantly more likely to achieve their important goals post-treatment, whilst again there was no significant change in the waitlist group. Increases in goal specificity were associated with parallel increases in autobiographical memory specificity whereas increases in goal likelihood were associated with reductions in depressed mood. These results suggest that MBCT may enable participants to clarify their important goals and in doing so increase their confidence in their capacity to move in valued life directions. A goal can be conceptualised as a future-oriented image of an ideal occurrence, stored in memory for comparison with actual occurrences (Cochran and Tesser 1996). Goals provide a source of motivation, representing targets or desired outcomes of self-regulatory activity, concepts which structure and direct behaviour (Carver and Scheier 1998). Goals differ in abstractness and scope. Theoretically, it is suggested that at the highest level, goals define the kind of person that an individual wants to be (for example the concept of the ideal self). Embedded within these very broad goals are a hierarchy of lower-order, more concrete goals which specify, in increasing detail, the actions which need to be taken in order to move forward in valued directions. Feedback processes monitor progress towards or away from the goals, generating affect and leading to goal reorganisation, or disengagement from old goals and re-engagement with new goals where progress is inadequate or blocked (Carver and Scheier 1998; Wrosch et al. 2003). Research in the social and clinical psychological literatures has converged on the suggestion that specification of goals, e.g. making explicit the lower order goals that underpin higher order goals, is important in determining successful progress towards higher order goals and plans. For example Latham and Locke (1991) in a summary of several decades of work on the effects of different types of goals on outcomes in organisational settings suggest that, independent of difficulty, specific challenging goals (‘complete 10 elements of the task by lunchtime’) lead to better outcomes than vague challenging goals (‘try to do your best on this task’), as well as to the spontaneous formation of plans and less variability in performance. Support for the idea that specification of goals is useful in increasing goal progress also comes from research on the formation of implementation intentions (see Gollwitzer and Brandstatter 1997). Implementation intentions are intentions which specify that the person will do action X in situation Y, e.g., they are goals which not only provide information on concrete actions but also the situation in which such actions should occur. In so doing, implementation intentions link actions to cueing conditions. Thus a person may have the general goal to “get fit” and may then specify this goal by forming the implementation intention “I will cycle to work on Mondays, Wednesdays and Fridays” so that the bicycle and the day of the week become cues to action. Research, primarily in health promotion contexts, provides good evidence that encouraging people to specify goals in the form of implementation intentions facilitates action, for example increasing uptake of testicular self-examination (Steadman and Quine 2004) or consumption of fruit and vegetables (Chapman et al. 2009). If formation of specific goals facilitates goal-directed activity, difficulty in formulating specific goals is likely to produce problems. Since failure to make adequate progress towards desired goals results in negative affect (Carver and Scheier 1998), lack of specificity of goals may be linked to heightened risk of depression. Consistent with this, Emmons (1992) demonstrated that individuals who are oriented towards more abstract goals (‘high level strivings’) perceive their goals to be more difficult to achieve and report more depression. Work in the clinical domain has also identified a lack of specificity in goals and plans as a problem for depressed and suicidal patients. For example Vincent et al. (2004) showed that patients who have recently engaged in parasuicide do not differ from hospital controls in the number of goals they have, but describe goals that are significantly less specific and more self-focused. These patients are also able to think of more obstacles on the path to goal attainment and are less able to generate specific plans of how to attain their goals. These findings mirror a number of studies which have shown lack of specificity in other areas of cognition amongst depressed patients, including autobiographical memory (Williams et al. 2007) and imagining of future events (Williams et al. 1996). Although specificity of memory and specificity of future goals have not been formally linked, there is evidence to suggest that similar processes may contribute to both, since over-generality of memory is known to be associated with the formation of less effective solutions to hypothetical interpersonal problems (Pollock and Williams 2001; Sidley et al. 1997). The abstract, ruminative cognitive style of people with depression is one factor that may contribute to lack of specificity in goals and plans. Social psychological research suggests that people differ, depending on context, in whether they tend to construe goals at a more abstract or more concrete level, with a focus on ‘why’ questions (which are typical of depressive rumination) tending to activate higher level, abstract goals and a focus on ‘how’ questions, tending to activate lower level, more concrete goals (Rabinovich et al. 2009). Consistent with this observation, it has been demonstrated that inducing depressed patients to adopt a concrete self focus, improves their social problem solving relative to adoption of an abstract self focus, and that increased concreteness of problem solutions mediates this effect (Watkins and Moulds 2005; see Watkins 2008, for a detailed analysis of the impact of abstract versus concrete construal level on repetitive thought and its consequences). Interestingly when people focus on high level, abstract goals they show a tendency to prioritise the desirability, function or purpose of goals over the feasibility or ease with which they can be attained, whereas when they focus on low level goals this leads to prioritisation of issues relating to the process and ease of attainment (Freitas et al. 2001). These observations have clear implications for the ability of depressed and suicidal patients, who engage in high levels of rumination and hence tend to operate at the abstract construal level, to self regulate adaptively in the face of unattainable goals—it is likely to be harder for individuals to disengage from desired but unattainable goals and re-engage with new goals when goal desirability rather than attainability takes precedence. Given the potential problems posed by a lack of specificity in life goals it is important to consider how goal specificity might be improved through treatment. One possibility is to teach goal-setting skills directly (MacLeod et al. 2008). Indeed, treatments such as Acceptance and Commitment Therapy (Hayes et al. 1999) explicitly encourage participants to clarify valued life directions (high level strivings) and then set specific goals which enable them to put these values into action (p. 227), whilst Problem Solving Therapy involves goal setting as a component in the step-by-step process taught to clients (Malouff et al. 2007). However experimental work suggests that broader alterations of processing style may also have an impact on related cognitive processes (Watkins and Moulds 2005). For example manipulations that promote a concrete processing style appear to have benefits for aspects of psychological functioning including autobiographical memory specificity (Watkins and Teasdale 2001, 2004) and emotional reactivity (Watkins et al. 2008), when compared to manipulations that encourage ruminative thinking. As such it is of interest to explore whether interventions, which do not target goal setting directly, but which encourage a shift towards more concrete thinking, are also able to influence goal specificity. Mindfulness training provides a means through which patients can learn to reduce their reliance on abstract, ruminative styles of thinking and instead increase their process-focus and ability to attend to direct moment-to-moment experience (Segal et al. 2002). One study has demonstrated that, consistent with findings from studies that manipulate mode of processing experimentally, a course of treatment with MBCT increases specificity of autobiographical memory (Williams et al. 2000). Additionally increases in mindfulness are associated with shifts in high-level self-related goals (Crane et al. 2008), suggesting the potential for MBCT to influence goal-related processes. In this study we were interested to explore whether a course of MBCT might have an impact on the specificity of life goals. We examined this question in a group of patients who were currently depressed with a history of suicidal ideation, and who were participating in a pilot randomised controlled trial of MBCT. We hypothesised that those patients who received immediate treatment with MBCT would show a significant increase in the specificity of goals from pre to post treatment, whereas those who did not receive MBCT would show no significant change. We also hypothesised that individuals who received MBCT would regard their goals as more achievable following treatment, whereas those allocated to the waitlist condition would show no significant change. As it was hypothesised that increases in goal specificity would be part of a broader shift in processing style in individuals receiving MBCT, we also examined whether changes in goal specificity were associated with comparable changes in autobiographical memory specificity, and whether changes in mood mediated the effects of treatment on goal-related processing. Participants were recruited from the community, through media advertising, as well as from local general medical practices, local psychologists and non-statutory organisations providing support for people with depression. Volunteers were requested who were currently feeling depressed, who had also been depressed in the past and who had suffered from suicidal thoughts or behaviours. Participants were included in the study if they met current diagnostic criteria for Major Depression or reported the presence of residual symptoms following a full episode, defined as either meeting DSM-IV criteria for only four instead of at least five symptoms of depression over the last 2 weeks or suffering from five or more symptoms at least for half of the days, if symptoms had not been present for most of the days over the past 2 weeks. All participants additionally had a history of three or more episodes of depression or chronic depression and a history of suicidal ideation (including thoughts of methods of suicide, rather than simply a passive wish to be dead) or suicidal behaviour. Individuals with bipolar disorder, or an eating disorder or OCD as their primary presenting problem were excluded. Individuals with borderline personality disorder, severe alcohol or substance dependence, learning difficulties or a lack of fluency in written and spoken English were also excluded. The study received ethical approval from the local NHS ethics committee (Mid and South Buckinghamshire NHS Research Ethics Committee, Ref: 07/Q1607/2). In total, 90 individuals from Oxfordshire contacted the research team in response to advertisements or as a result of referrals. Following a pre-screening via telephone 47 were invited in for an assessment interview, of which 31 were found to meet all criteria and requirements. Of those who had entered the trial, three participants chose to withdraw prior to the post treatment assessments (two discontinued the treatment intervention and withdrew from the study and one withdrew from the waiting list condition due to time pressures). Additionally one participant did not provide complete data on the goals task at the baseline assessment. Complete data on goals were therefore available for 27 participants (TAU: N = 13 and MBCT: N = 14). Finally one participant did not provide complete autobiographical memory data, so 26 participants were available for analyses involving autobiographical memory specificity. Nine males and 18 females provided full data sets for analyses of goal specificity. The mean age of these participants was 41.9 (SD = 10.5, range 26–64) and the mean years of education was 15.8 (SD = 3.2, range 11–22). The MBCT (n = 14) and TAU (n = 13) groups did not differ significantly in gender distribution, age, marital status, employment and level of education. Participants attended an initial session during which they were assessed by interview and through the completion of a number of self-report questionnaires. Those participants who were eligible for the study were invited to a second assessment session during which they completed several additional questionnaires, the goals task and the autobiographical memory test (Williams and Broadbent 1986). Following completion of the baseline measures participants were randomly allocated to either immediate treatment or to a waitlist condition. Following treatment, or the comparable waiting period (approximately 3–4 months) participants were reassessed and those in the waitlist condition were offered treatment. Details of the treatment received and main clinical outcomes of the study are given in Barnhofer et al. (2009) and only measures of direct relevance to the current study are described below. Current and past diagnostic status was assessed using the Structured Clinical Interview for DSM IV Axis I (SCID-I; First et al. 2002). Initial interviews were conducted by an experienced post-doctoral research psychologist. Beck Depression Inventory (BDI-II; Beck et al. 1996). The Beck Depression Inventory (BDI-II) is a well-established measure of depressive symptomatology. The BDI-II has excellent internal consistency and good 1-week test–retest stability in patients (Beck et al. 1996). The BDI-II was administered at both the pre and post treatment or waitlist assessments. Measure to Elicit Positive Future Goals and Plans (Vincent et al. 2004). Participants were given 60 s to generate as many goals as they could think of for the coming year in nine different life domains. Goals were defined as ‘things that you would like to happen or things that you would like to be true of your life in the future’. Participants described each goal and their response was recorded, verbatim, by the experimenter. Following the goal generation phase participants reviewed their goals and selected the six most important. These goals were then transferred on to ratings sheets and participants were asked to rate how likely they thought it was that they would achieve the goal on a scale from 1 (not at all likely) to 9 (extremely likely). Following completion of the task, goals were scored for specificity using a manual developed by Vincent et al. Goals were scored on a scale from 0 to 3 where 0 represented a non-specific goal and 3 represented a highly specific goal. According to the manual, goals to be scored as “0” are those that specify an action that could be applied to any life domain (e.g., “be assertive”, “cope better”). Goals coded as “1” are those which specify an action in a specific life domain, but which could be divided into further sub-tasks (e.g., “get fit”, “eat sensibly” “get on better with my family”). Goals coded as “2” are those which specify actions in specific domains and which could be followed by the average person without the need for further clarification (e.g., “go swimming”, “get my driving licence”). Finally goals coded as “3” are those which specify actions in a specific domain, as in “2”, but include further specifying information concerning how or when the action would be completed (e.g., “arrange a meeting next week to speak to my boss about reducing my hours” “sign up for a photography course at the local college this autumn”). In general goals coded as zero or 1 are regarded as general and goals coded as 2 or 3 are regarded as specific. Goals generated both pre and post the treatment or waitlist phase were rated for specificity by an assessor blind to treatment condition. To ensure reliability a second rater (CC) rated a random sample of 60 goals taken from the baseline assessment. The correlation between raters was high, r = .78, P < .001, and inter-rater reliability, assessed by computation of the linear weighted kappa, was good, k = .71. Autobiographical Memory Test (AMT; Williams and Broadbent 1986). The AMT was presented twice, once at the baseline and once at the follow-up assessment, with two comparable versions of the task created and order of presentation counterbalanced across participants. Each version of the AMT contained 18 cue words, 9 positive and 9 negative matched for frequency using data obtained from the University of Western Australia Psycholinguistic Database. Participants were instructed to retrieve a memory of a specific event in response to each word. A specific memory was defined as a memory of an event which lasted less than a day and occurred at a particular time and place. Participants were given three practice words before the task commenced and practice continued until specific memories had been retrieved to at least two of the three practice cues. All participants were able to retrieve at least two specific memories during the practice phase with the help of prompting and the use of examples. In the test phase participants were given 30s to respond to each cue word and were requested not to repeat memories or retrieve memories of events occurring in the past 7 days. In line with previous research, memories were coded as specific, extended, categoric, semantic associate or as an omission by one of two research assessors, both blind to treatment condition. A sub-sample of 180 memories was rated by both assessors, to establish reliability of coding. Analyses reported here were based on the number of specific memories retrieved and the unweighted kappa for the distinction between specific and non-specific responses (extended/categoric/associate/omission) was good, k = .77. Data were analysed in SPSS version 15. Variables were explored for normality and outliers. There were no univariate outliers and thus no cases were excluded from the analysis. Variables were assessed for normality. Two variables, those assessing baseline goal specificity and change in goal specificity, yielded significant kolmogorov–smirnov statistics. However these variables had non-significant values for both skewness and kurtosis. Thus an ANOVA approach, which is regarded as relatively robust to minor deviations from normality, was adopted. All participants had a history of chronic/recurrent depression and suicidal ideation or behaviour. At entry to the study mean BDI-II score for the sample as a whole was 31.5 (SD = 10.3) with no significant difference in mean score between people allocated to the immediate treatment and waitlist arms of the trial. Approximately two thirds of the sample met full criteria for MDD at entry to the study and the remainder were experiencing sub-threshold symptoms following a full episode. A 2 × 2 repeated measures ANOVA of BDI-II scores with time (pre, post) as the within- and group (immediate, delayed) as the between-subjects factors revealed that the main effect of time, F (1, 25) = 13.58, P = .001, and time × group interaction, F (1, 25) = 7.13, P < .001, were significant. This resulted from a significant decrease in BDI-II score in the MBCT group, M I−J = 13.41, SE = 2.93, P < .001, in the context of no change in those allocated to TAU (See Barnhofer et al. 2009 for full report on clinical outcomes). The mean total likelihood rating for participants’ six most important goals was 30.4 (SD = 9.5) corresponding to a mean score of approximately ‘5’ for each goal on the 1–9 scale of likelihood. This indicates that at the baseline assessment participants felt that their goals were moderately attainable. The mean specificity score across the six goals was 5.6 (SD = 1.8) corresponding to a mean specificity rating for each goal of just under ‘1’ on the 0–3 rating scale. This suggests that at the baseline assessment participants’ goals tended to be relatively non-specific, a rating of 1 corresponding to goals which specified a life domain but which lacked information about when or how the action described in the goal might be carried out. There were no significant differences between those allocated to immediate treatment and those allocated to the waitlist arm in baseline measures of goal likelihood or specificity. A 2 × 2 mixed ANOVA was conducted with time (baseline, follow-up) as the within-subjects factor, group (immediate treatment, waitlist) as the between-subjects factor and goal specificity score at baseline and follow-up as the dependent variables. Both the main effect of time, F(1, 25) = 4.13, P = .05, and the time x group interaction, F(1, 25) = 4.13, P = .05, showed trend level effects. Post-hoc tests indicated that the immediate treatment group increased in specificity from baseline to follow-up, M i−j = 1.17, P < .01, whereas there was no change in the waitlist condition, M i−j <= .001, P = 1.00, (see Fig. 1). One possibility is that changes in goal specificity are secondary to changes in mood, brought about by treatment. In order to explore this we examined the correlations between change in BDI-II score and change in goal specificity, both for the sample as a whole, and for each arm of the trial separately. In none of these cases were significant correlations revealed (all rs < .25, all p > = .10), suggesting that changes in goal specificity are not simply a consequence of improvements in depressed mood in the group receiving immediate treatment with MBCT. We also explored whether changes in goal specificity were associated with comparable changes in specificity of autobiographical memory (quantified as change in number of specific memories retrieved from pre to post treatment or waitlist), again using correlation. These analyses indicated that change in goal specificity was significantly correlated with change in autobiographical memory specificity both for the sample as a whole, r (26) = .55, P < .01, and for participants allocated to MBCT, r (13) = .67, P < .05, although not for those allocated to the waitlist arm of the trial, r (13) = .16, P > .50. Change in memory specificity did not mediate the effect of MBCT on goal specificity since the regression coefficient for the effect of randomisation group on memory specificity was non-significant, and hence one of the necessary conditions for establishing mediation was not met (see guidelines outlined in Baron and Kenny 1986). However the significant correlations suggest that increases in goal specificity may in part reflect a broader increase in cognitive specificity in people receiving MBCT. A 2 × 2 mixed ANOVA was conducted with time (baseline, follow-up) as the within-subjects factor, group (immediate treatment, waitlist) as the between-subjects factor and goal likelihood as the dependent variable. The ANOVA revealed a trend level effect of time, F (1, 25) = 3.33, P < .10, and a significant time x group interaction, F (1, 25) = 8.47, P < .01. Post hoc tests indicated that participants in the immediate treatment group increased significantly in perceived likelihood of attaining their goals from baseline to follow-up, M i−j = −5.71, P < .01, whereas those in the waitlist condition showed no significant change M i−j = 1.31, P > .40. The results are shown graphically in Fig. 2. We explored whether changes in goal likelihood might be a consequence of changes in mood, brought about by treatment. Correlation coefficients indicated a significant association between BDI-II change and goal likelihood change for the whole sample, r (27) = .63, P < .001, as well as for those allocated to MBCT, r (14) = .73, P < .01, but not those allocated to the waitlist condition, r (13) = .44, P > .10. To explore whether change in BDI-II mediated the effect of randomisation group on outcome we again conducted a test for mediation (Baron and Kenny 1986). First we regressed randomisation group on goal likelihood change, yielding a significant regression coefficient, β = 7.02, SE = 2.41, B = .50, t = 2.91, P < .01. We next regressed randomisation group on BDI-II change. This yielded a significant regression coefficient, β = 10.71, SE = 4.11, B = .46, t = 2.61, P < .05. We then regressed BDI-II change on likelihood change in the presence of randomisation group. The regression coefficient for BDI-II change was significant, β = .30, SE = .10, B = .51, t = 3.04, P < .01, whilst the regression coefficient for the effect of randomisation group on likelihood change was no longer significant, β = 3.97, SE = 2.32, B = .28, t = 1.71, P = .10, indicating full mediation. 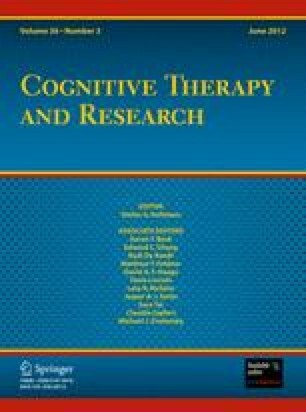 A Sobel test confirmed the significance of the mediation effect, Sobel test statistic = 2.19, P < .05, indicating that the increase in perceived likelihood of attaining goals from baseline to follow-up could be completely explained by the improvements in mood observed in the MBCT group. It has been suggested that goals that are more specific are perceived to be more attainable, probably in part because they provide more information to structure action. In order to explore whether changes in goal specificity were associated with changes in likelihood, we correlated these measures across the whole sample. These correlations indicated a significant association between change in specificity and change in likelihood, r = .49, P < .01, which remained after controlling for change in BDI from baseline to follow-up, r BDI = .46, P < .05. Previous research has identified a lack of specificity in important goals for the future as characteristic of patients who are depressed and suicidal (Vincent et al. 2004). This is of clinical interest because goals that are less specific (typically goals drawn from a higher level in the goal hierarchy) are broadly regarded as being more difficult to achieve, since they lack information that can direct behaviour and provide cues to action (Emmons 1992; Gollwitzer and Brandstatter 1997; Locke and Latham 2002). It has also been suggested that individuals who construe goals at a higher level tend to prioritise the value or importance of goals over ease of attainment, whereas those who construe goals at a lower level tend to be more focused on the process by which the goals will be achieved (Freitas et al. 2001). When unresolvable challenges are faced in attaining important goals, disengagement from these goals may be adaptive (Wrosch et al. 2003). However this process is likely to be resisted if goal meaning or importance is given greater weight than the practicalities of goal attainment. The results of this study show that patients with depression who had received treatment with MBCT reported significantly more specific life goals post treatment than pre-treatment, whereas those who were allocated at random to a waiting list condition showed no significant change, with these effects not mediated by changes in mood. Participants who received MBCT also reported a significant increase in the perceived likelihood of achieving their important goals whereas the waitlist group showed no significant change. In this case, changes in mood mediated the effect of randomisation group on goal likelihood change. Because mood and goal likelihood were assessed concurrently only future research assessing changes in both likelihood estimates and mood on multiple occasions would be able to establish whether changes in mood precede changes in goal likelihood estimates, or whether in fact changes in the perceived likelihood of attaining important goals prompt an improvement in mood. There are several ways in which treatment with MBCT may act to increase goal specificity. First, research suggests that individuals who adopt an abstract mode of processing (which is characteristic of, but not confined to, people with depression), are more likely to construe goals at an abstract level. Studies which have used experimental manipulations to increase concrete thinking have demonstrated concurrent increases in the concreteness of problem solving plans and autobiographical memory specificity (Watkins and Moulds 2005; Watkins and Teasdale 2001, 2004), and previous studies have reported a similar effect of a course of MBCT on the autobiographical memory (Williams et al. 2000). If MBCT is able to produce a shift in mode of processing it would be expected to also produce changes in the concreteness of goals. The increase in goal specificity observed may represent such an effect. Consistent with the idea of a broader increase in concreteness of thinking produced by MBCT increases in goal specificity and increases in autobiographical memory specificity were moderately correlated for the sample as a whole and for those allocated to MBCT. MBCT may also, through its cognitive therapy elements, and through its general emphasis on self-compassion, encourage participants to reflect on the specifics of their current lifestyle (through monitoring pleasant and unpleasant events, the identification of nourishing and depleting activities and so on) and in so doing recognise both aspects that are functional, bring pleasure or enhance well being, and those that are unhelpful and deplete energy and resources. These exercises may naturally lead individuals to think in more concrete terms about how to set manageable goals that will enhance future well-being. Although the findings of the current research are interesting and consistent with existing literature in the area, there are a number of limitations that must be considered. Most notably the data reported here were collected as part of a small pilot trial of MBCT for chronic suicidal depression. As a result the sample is relatively restricted in its clinical characteristics, potentially limiting generalisability, and was also small in size, limiting power. Further although it was beyond the scope of the current study to include an active control treatment, comparing the effects on life goals of MBCT and another active treatment that addresses goal setting processes more directly (for example problem solving therapy, or Acceptance and Commitment Therapy) would be a particularly interesting line for future research. It was not possible from this study to determine the extent to which changes in specificity were a function of changes in the content of goals, the increasing specification of existing goals and/or the increased prioritisation of existing goals higher in specificity. Future research on larger samples would benefit in particular from exploring how goal content changes. It was not our impression from examining the data that people who had received MBCT changed markedly in the nature of the goals they described, but a formal investigation of goal content change, perhaps including qualitative work examining patients’ perceptions of changes in life goals would be informative. Finally these findings are limited by the absence of a follow-up period and therefore it is not clear whether changes in goal specificity persist over time or are predictive of longer-term outcome. Despite these limitations, the findings remain of interest. It is important to understand not just how treatments such as MBCT target clinical symptoms, but also the mechanisms through which such treatments build resilience and reduce risk of relapse. Goals contribute to a person’s sense of meaning in life and the ability to set and effectively pursue goals is at the heart of adaptive self-regulation. Although preliminary, the data presented here suggests that MBCT is able to increase both the specification of important life goals and the perceived likelihood of their attainment, changes which may have significant implications for a person’s ability to move forward in life with confidence. As such examining in more detail how MBCT influences goal-related self-regulation is likely to be a promising angle for future research. We would like to thank our participants for giving their time to complete our assessments. This work was supported by a Francisco Varela Award from the Mind and Life Institute and by the Wellcome Trust, 067797/Z/02/A.